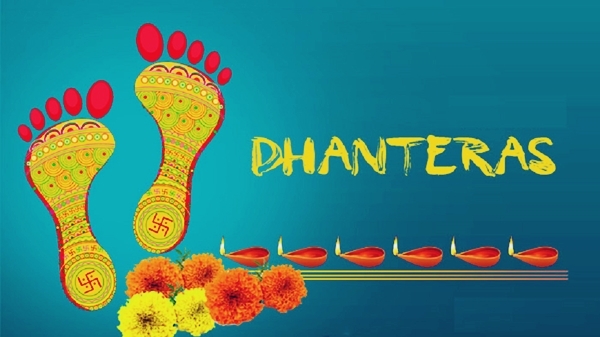 Happy Dhanteras Date in India 2019: Dhanteras, is the first day celebration of the five days long Diwali festival celebrations throughout the India as well as outside the country. The meaning of Dhanteras is puja of wealth at 13th day (in the Krishna paksha, dark fortnight) of the month of Ashvin according to Hindu lunar calendar. Goddess Lakshmi puja is held at this day and there is a custom of purchasing things and bring it at home in the myth of Lakshmi came at home. It brings home a lot destiny and prosperity. At this great occasion people generally repair their home, white washing, through cleaning, decorate house interiorly and exteriorly, make rangolis, light clay diyas and many more traditions to follow. They stick readymade footprints of goddess Laksmi to come wealth and prosperity to their home. After sunset people chant mantras, bhakti songs and arti of goddess Laksmi and lord Ganesh. On the day of Dhanteras, business premises are renovated and decorated. Entrances are made colorful with lanterns and traditional motifs of rangoli design to welcome the goddess of wealth and prosperity. To indicate her long –awaited arrival, also small footprints are drawn with rice flour and vermillion powder all over the houses. Lamps are kept burning all through the night. There is a peculiar custom in Maharashtra to lightly pound dry coriander seeds (dhane in Marathi for Dhanatrayodashi) with jiggery and offer as naivedya. The legend being celebrating Dhanteras is the story of 16 year old son of king Hima. He was forecasted to death by the snake biting at the 4th day of his marriage. His cleaver wife find a way to save her husband’s life, she collected lots of her ornaments and coins and made a heap at doorway of his bedroom. She recited the stories in order to keep her husband awaken. The god of death, Yama had arrived in the form of serpent, suddenly his eyes were started dazzling because of the lighting lamps and jewelry. He was unable to enter the room. And hence he tried to climb over heaps of the coins. But after listening to song of prince’s wife he sat down there for whole night. And slowly it became morning and he went away without taking her husband. From then the day was started celebrating as Dhanteras. Another legend being celebrating Diwali, the ocean was churned by Gods and demons to get an Amrita or nectar. Dhanvantari (known as physician of gods and embodiment of lord Vishnu) has emerged out from the ocean churning. The same day is celebrated as the Dhanteras. According to the Hindu mythology there are variety of customs and traditions followed by the Hindus at this festival. People consider it is a good to buy new things such as gold and silver coins, jewelry articles, new utensils or the other new things. People consider that bringing new things at home is the sigh of Laxmi coming home whole year. Lakshmi puja is carried out in the evening and people lit various diyas in order to drive out the evil spirit shadow. People sings bhakti songs, aarti and mantras as well to drive out the evil powers. People in the village decorate their cattle and worship as they understand them their major source of income. South Indians offers decorated cows as an embodiment of the goddess Lakshmi. Bringing new things at home is a very auspicious event at the Dhanteras. People perform Lakshmi puja during the subh muhurta according to the calendar, at some places several cereals (wheat, gram, barley, urad, moong, masoor) are worshipped while performing puja. Golden flower and sweets are offered during puja to the Mata Lakshmi. This festival plays a great role in the life of every people. It brings a lot happiness, wealth, prosperity, wisdom, and good destiny for all. People clean up everything at this day in order to remove bad energy and idleness from their surroundings. People take bath and wear new clothes in order to clean up their body, mind and soul before performing puja. As this day is birth day of Dev dhanvantari, all the new innovations related to medical science are established at this day. People even also open their new bank accounts on this day as a new beginning to their financial journey. People also deposits lots of money to their accounts and savings on this day. A girl child born on Dhanteras is considered auspicious because it is said that goddess Lakshmi has arrived in the house. Hence, Dhanteras is an extremely significant day for all the Hindus. Also in some regions of western India people at the evening of Dhanteras performs a task where their put up all their cash they have in their houses in front of god and big pooja is done. The money is kept all over the night in front of god so that they will give good and positive blessings to increase their wealth. Why it is different from other festivals? Unlike other festivals, Dhanteras is different because on this festival people worshipped their wealth, the things which acts as a source to get wealth, all such objects are worshiped, as per financial point of view is concerned all the tasks are performed in order to increase the wealth. Hence as a nation point of view a lot of sales, markets are fully filled on the day of Dhanteras. A great boost up or growth is recorded in the selling market of India on this day. People who buy things are happy having smile on their faces as they are happy to buy things on this beautiful occasion and the people who sold these things are too happy due to overwhelming response they receive in their markets on this day. This is the power of Dhanteras spreading wealth, happiness and positive vibes all over the nation, hence it is surely different from other festivals.